A wagon for the "Medicus"
There were so many telephone calls with the designer from the UFA film company before we finally had a design for the wheels that was doable and drivable. 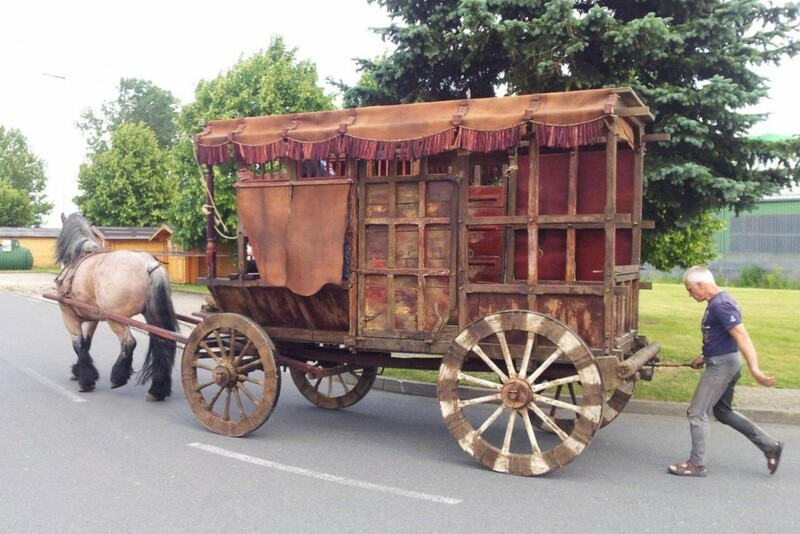 They wanted me to build the barber’s wagon for the filming of the book “The Medicus”. The first conversation about the project took place in autumn 2012; filming was planned for June 2013. By the time the planning had been completed and I could start working, it was already May! And then suddenly I heard, “we need two identical wagons because one of them catches fire!!!! I set right to work! Time only allowed that I build the chassis—the UFA built the carriages themselves. It was quite an unusual project. I had to keep to the state of the art for wagon building in the Middle Ages. But in the end, the technical details required that I use a little new age technology too. After the underlying structure was built, both wagons went to the UFA in Berlin to receive their carriages and patina. When the wagons were finished, the film horse—a beautiful Ardennes—was hitched up for the test drive and, for him, pulling the wagon was a piece of cake. I got to spend a day watching the filming in Harz. I hardly recognized the wagons. They’d been so transformed that it was easy to believe they were an authentic relic from 12th century England. Creating something drivable from the UFA designer's ideas was a challenge. Our horse Aaron, the good-natured test pilot. Test drive of the complete vehicle ... an easy task for the film horse, a beautiful Ardennes. We spent a day watching the filming - an extraordinary experience ! Like a relic from 12th century England ! - I mean the wagon, of course !